The Morrison Street site has lain vacant now for half a century. The end could be in sight for one of the Capital’s biggest gap sites after a developer initiated the first steps of the planning process. Development firm M&G Real Estate, the investment arm of insurer Prudential, has submitted a fresh application detailing their proposals for the delay-plagued vacant Haymarket site. M&G, who purchased the former goods yard next to Haymarket Station last June, also pumped £80million into phase 3 and 4 of the city centre Quartermile development. Initial proposals for redevelopment of the site comprise of ‘hotels, offices, retail, leisure, public houses, restaurants, car parking and associated works’. The developer is holding a public exhibition on Thursday at the Hilton Grosvenor Hotel to further discuss its vision for the four-acre mixed used development site on Morrison Street. The development at the heart of Edinburgh’s financial and commercial centre promised to be the city’s best connected office location, being within a couple of minutes’ walk of tram, bus links and Haymarket station. But the planned overhaul of the property has suffered from numerous setbacks, prompting former owners Interserve to put the site on the market in February last year. Approval has already been granted for a 190-room hotel and a separate 172-room aparthotel. Cafes, bars and restaurants are part of the project. However, it appears the new investors want to put their own stamp on plans and have began a new planning process with the city council. The development would also include office buildings, something city centre Tory councillor Joanna Mowat feels is much needed. She added: “Development of this site will be welcomed. There is a real need for grade A office space close to the city centre. This development will take the pressure off other sites. 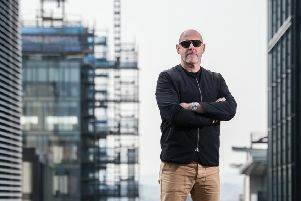 Interserve had been working alongside Irish firm Tiger on building the development at the heart of Edinburgh’s financial and commercial centre since 2013. The former owners had been forced to push back the start date for construction works from the spring of last year to 2018 after railway tunnels running under the site needed to be strengthened in an unforeseen delay. It means the prominent site has lain empty for half a century. A timeline for construction works and an expected start date are yet to be announced. Residents are encouraged to go to the Hilton Grosvenor Hotel between 11am-1pm and 2pm-8pm for more information.